Baking is BIG NEWS this week – thanks to the whole Great British Bake Off scandal! But even before the dramas of #BinGate, GBBO had an established place in modern culture, which has helped make baking really rather fashionable. Whenever I think of baking and dating, I can’t help but be reminded of a childhood friend, who when we were 15, asked one of my friends over to his house to ‘bake bread’ with him. At the time he was teased immensely, and we all inferred that ‘baking bread’ was a euphemism. But it turns out he was actually just lightyears ahead of us when it came to knowing what a good idea a cookery class is for a date! Baking is something I’ve never done on a date before, but as some of you will know, my role as Guardian Soulmates’ Blog Editor means every month I get to fix two singletons up on a special date. This month I wanted to arrange a rather different date, and so I enlisted the help of professional baking instructor and pastry chef, Kate Mooney, of Eat & Mess. Based in the heart of Crystal Palace Triangle, Eat & Mess offer hands on, informative classes in a variety of baking and decorative skills. The baking school teach various bread making classes, patisserie, pastry and afternoon tea cake baking, and can arrange private classes, group classes, or events such as hen dos. Kate was running a private class for the Soulmates Date, but with myself and a friend chaperoning, so there were actually 4 of us cooking. The dynamic was interesting as I think this kind of date could work well in two ways. If you chose it as a first date, I actually think it would work best to sign onto a group class. I’ve done a number of first dates in group settings – including Sushi Making last year with The Oxford Blue – and I think seeing your date interact with other people can tell you a lot about him or her. I think being around other people also lessens the intensity of the date, and going on a date to a class is a really simple, easy dynamic, as the teacher will lead conversation, fill silences, and even help start discussions. If you’re on a second or third date with someone and really hoping to impress them, I think a private class works really well. Long haul blog fans may remember The Dapper Gent took Blonde Ambition to a cake-making class, and arranged for the baking teacher to bake all Blondie’s favourite cakes, which I think is a really lovely touch. I know I talk often about the physical dynamic of a date, but working side by side, or talking across an activity, which you need to concentrate on, can definitely remove the pressure that you can feel by chatting face on, over drinks or dinner. The daters (and us chaperones) were making four different kinds of bread. 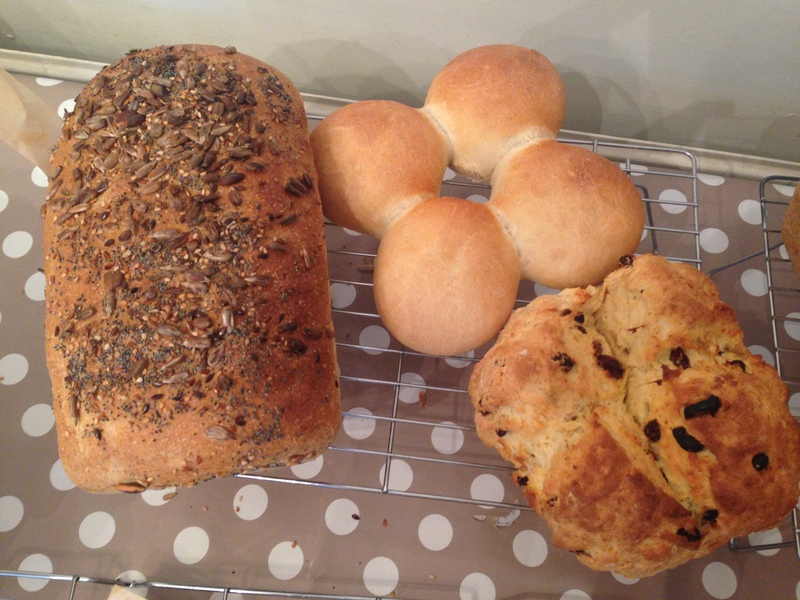 The 3 hour class would see us leave, having made a seeded loaf, a batch of white rolls, soda bread, and olive grissini. At first we didn’t believe we’d fit all the breads in, but Kate made sure we always had something to do. First we are the brown loaf dough, then the white roll dough. We kneaded each dough three times, leaving it to warm and rise in between, and then we shaped the loaf, and then the rolls, before the final proof. 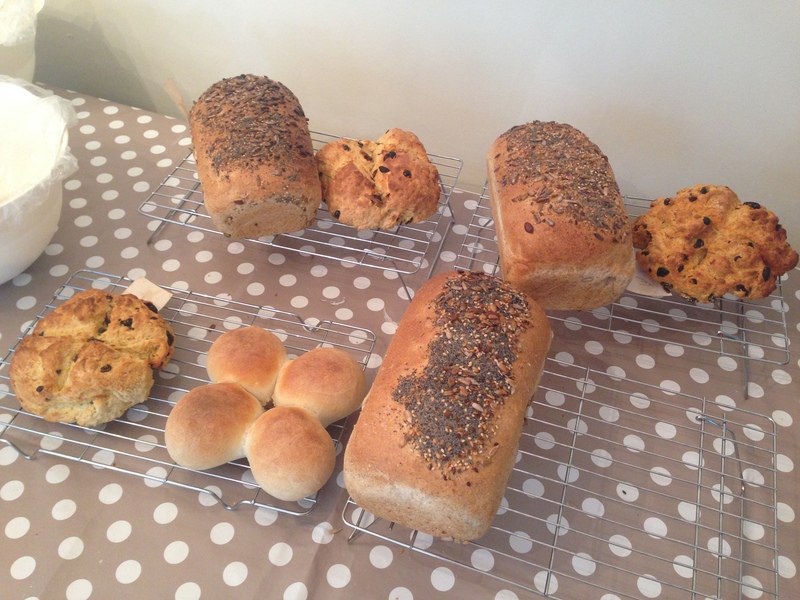 I really enjoyed rolling the bread and shaping it into a loaf, though I found making the rolls a bit tougher! 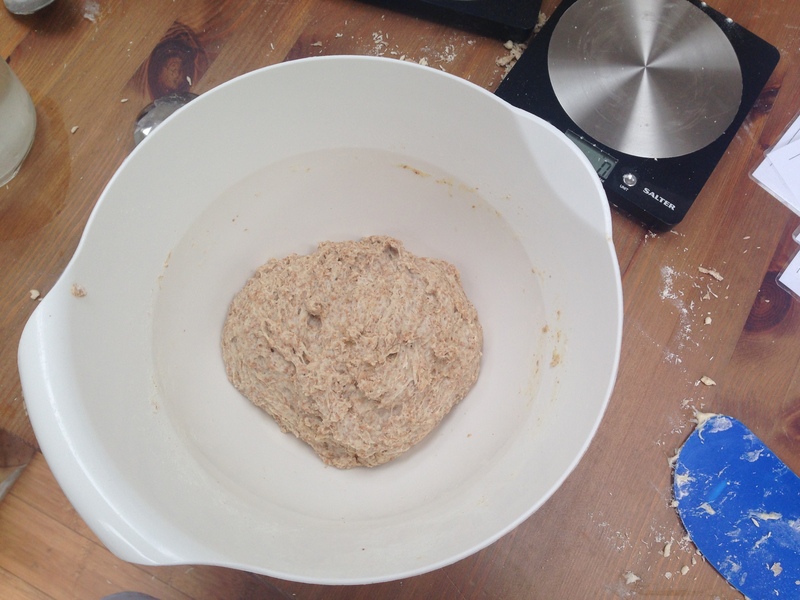 Next we tackled the soda bread, adding in raisins for extra flavour. 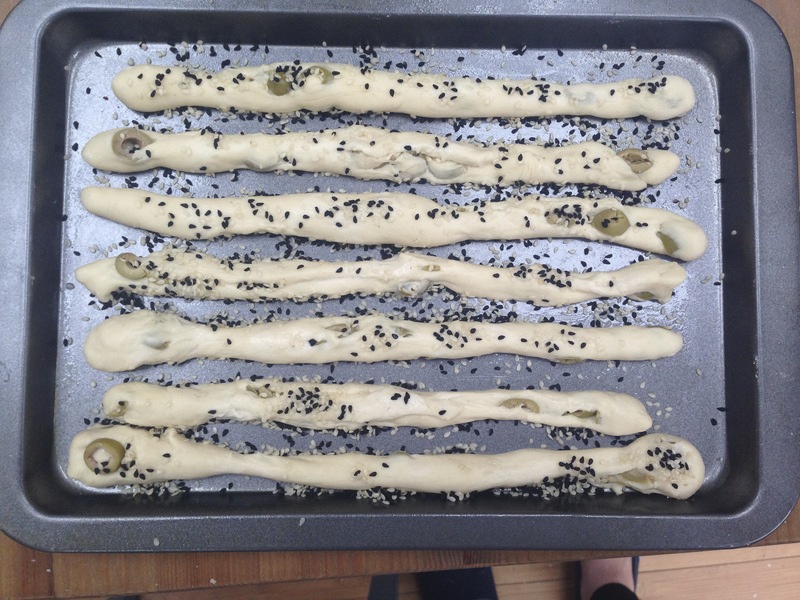 Finally we rolled out finger-width breadsticks, filled with chopped olives and topped with seeds. I went home with two bags of the most incredible-smelling bread, which I’ve spent all weekend eating! It was such an interesting, fulfilling way to spend an afternoon, and as someone who mainly cooks with her microwave and grill, I left with a real sense of achievement. 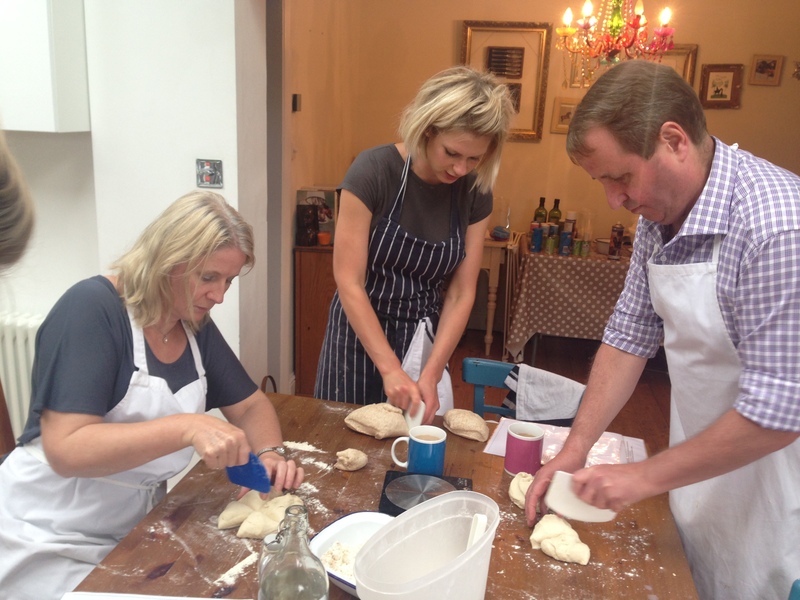 I learned a lot about baking, and really enjoyed the afternoon – and to be honest I was a bit gutted that I hadn’t been the one on the date, as I think this would be a brilliant date! I might have to find someone to go on another one of the Eat & Mess classes with me – I think making your own Afternoon Tea could be a winner! Towards the end of the afternoon, all I wanted to do was eat what I made, so I would definitely recommend doing the class as a morning class, popping to a deli or supermarket, picking up some dips, sandwich fillings, and some other picnic staples, and then turning the fruits of your labour into a picnic. That way you could make the date a two-stage affair (a technique a lot of people swear by to make you feel like you’ve experienced more with the other person), and go from a public setting, to a more intimate one-on-one scenario.